Lock in a great price for Hotel Tell – rated 8.3 by recent guests! 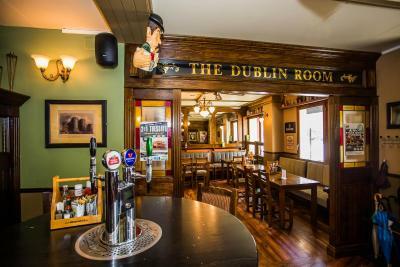 Perfectly located within walking distance of town, also right next to bus stop, great breakfast and incredibly nice, helpful staff. Great mountain view! Fun Irish pub on ground level. Will stay here again! The staff was extremely nice, the bed was very comfy, and the location was just what we needed. It was surprisingly quiet, considering it’s above a pub. The bakery across the street was delicious. I was very happy during my stay. Service was very good. Staff were very helpful. Very clean and tidy room. The beds were super comfy. The pub is very convenient and really good. The staff is amazin and so friendly. I really liked the front desk agents ! Very accommodating super helpful, and informative! My room was AMAZING! Only thing I with they had a small fridge and a microwave;-)! Still Fantastic with out tho! 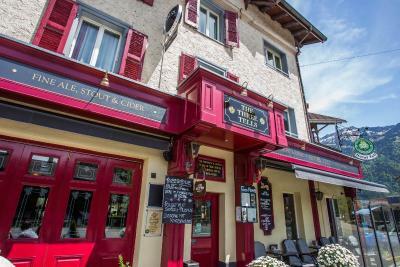 Location (next to some of the best food you'll find in interlaken), the place was adequate, comfy and the staff very helpful. Only in town one night, and they made me a ‘to go’ bag for my breakfast as I was leaving before breakfast opened. So kind and helpful! 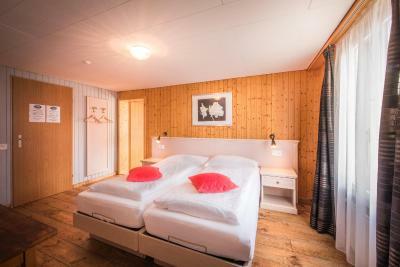 One of our top picks in Interlaken.Hotel Tell is located in the center of the well visited Matten bei Interlaken, 1.9 mi away from Lake Brienz and 3.1 mi from Lake Thun. It sells ski passes and offers free WiFi in public areas. Guests can relax on the sunny terrace or rent bicycles in nice weather. A coffee bar is also available on site. 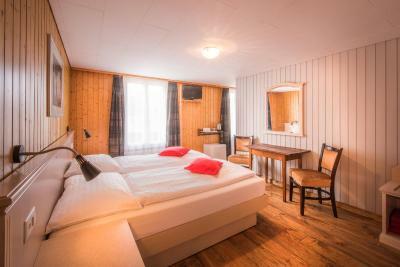 The Tell offers traditionally furnished rooms with private bathrooms and hairdryers. Laundry service is available on request. 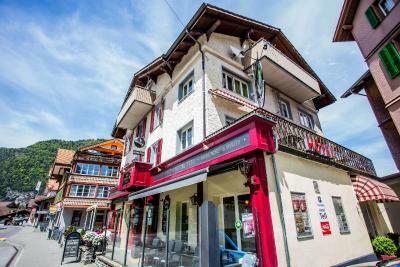 Tell Hotel is a 15-minute walk from the Interlaken West and Ost train stations and free public parking is offered on site. The hotel's owners provide help with arranging and booking several activities and they can offer extensive information about the area. When would you like to stay at Hotel Tell? 2 bedrooms, living room, kitchen and 2 balconies with mountain views. 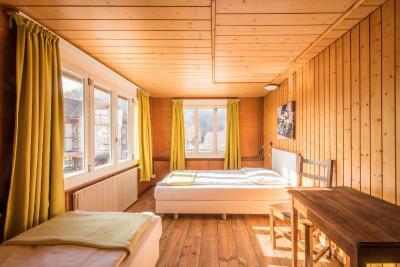 This unit consists of 2 interconnecting rooms with a private bathroom. Built in 1890, the Hotel Tell is a small part of the history of Matten. 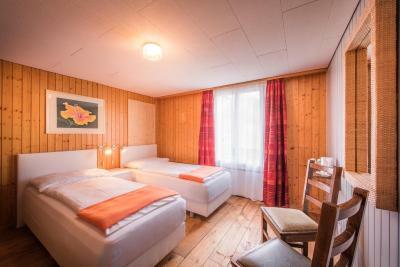 It is a family run hotel with only 10 rooms and a holiday apartment. It has a friendly home-away-from-home feel. 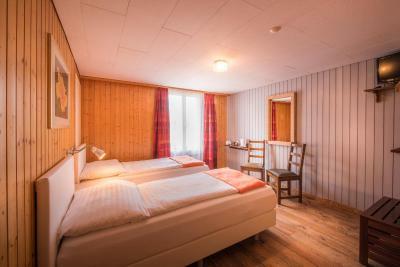 All the rooms have been renovated with solid wooden floors, and new box-spring beds, making it comfortable and quieter. Each room has a kettle, with complimentary coffee & tea. House Rules Hotel Tell takes special requests – add in the next step! Hotel Tell accepts these cards and reserves the right to temporarily hold an amount prior to arrival. Location is very nice and staff are amazing! The toilet and shower are old and the water goes from cold to burning hot. Excellent location if it’s your first time. Bus stop is right across, Coop supermarket is a 3 minute walk. 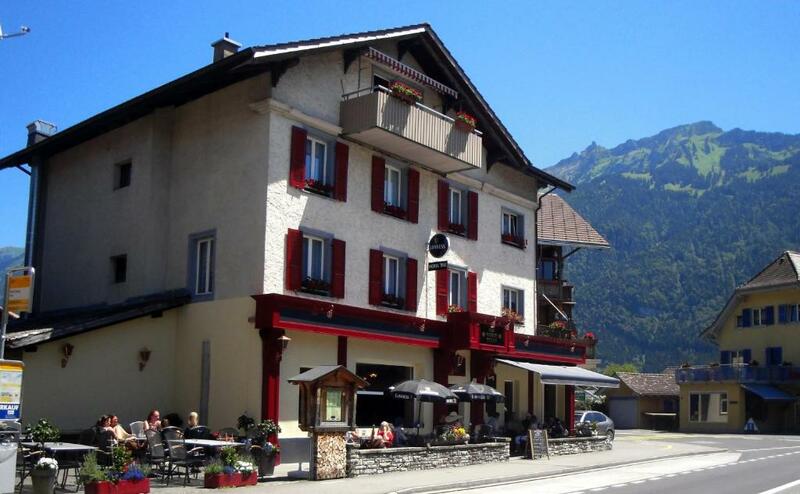 Interlaken Ost is 13-14 minute walk or 5 min zip in the bus. The staff is super helpful and courteous. The rooms were very creaky and the parking included was difficult. Sometimes there weren’t spots open and the lot was very hard to enter. 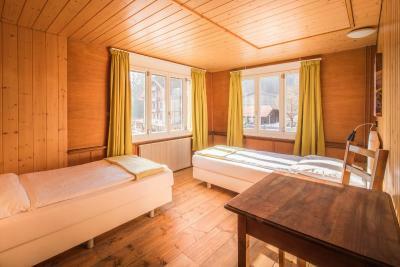 Wooden room, flexible changing shelves, kettle, toiletries, check in style. Nothing, the room was outstanding and bed super comfortable. My wifi wasn't super strong on my second night but still worked well! would love to come back! What an amazing deal for such a beautiful location! I am a solo female traveler from America and this property was everything I could want and more. Staff spoke english and were super kind and accommodating and the view from the room was breathtaking!This hotel was one of my favorite parts of my stay in Interlaken! Lots of stairs to climb to the apartment, but it is totally worth it! The check in experience is so nice (don’t be surprised when you are at the door way to find the key;) ) and the room is perfect for the view in the morning. The bus station is just beside. Very convenient and comfortable stay! The staffs are friendly and helpful. Room and toilet were clean and comfortable.